"We took the usual road." "It doesn't look like it." At long last, the second season of The Returned has arrived, and in all of its pensive scaled back French glory. 'The Child' is, as ever, brimming with the mercurial longing fans of this show have come to appreciate. But now there are themes of isolation, separation and reclusion to add to this unusual gorgeous series. If, like me, you thought this town, previously, had a layer of dread licking at its moody exterior, well, this season we're going to be drowning in it. There are a great many things I admire about The Returned. The pacing is very bold, courageous, even – there's simply no hurry to get anywhere in this story. The outcome of this, for one, means there's nary a contrivance, a compulsion or a trick played on viewers. By some creative miracle, this is a show about something unimaginable that doesn't care to focus on the execution of the logistics of its towering concept – only how people feel about it. There's a simplicity to the dialogue, it's really as stripped down as it gets. (I don't speak French, but consistently the subtitles seem to match up in word count.) These characters speak to one another in a compact way. There is no effort needed for interpretation. What's left then is the color palette, the scenery, the music (you know me so well if you can guess how much I ache over the score! ), the way the characters interact without words – all which merge liquid-like and seep into our psyches to fill in the cracks and give us the whole experience. Of course this town is underwater. An expectant Adèle is the primary focus of 'The Child'. Her pregnancy symbolizes the future of this town in a unique way since the baby's father is one of the returned. And though it seems every pregnancy trope on a supernatural show is present (even a few that belong to science fiction! ), I found myself wanting only to search her face for her feelings on the matter. Her bare-bones admission that she doesn't want the child, she never did and that's she's actually tried to take matters in her own hands to end the pregnancy (more than once) is infinitely more compelling that what will come out of her. L'Enfant represents the messiest of all messy emotions for her. Along with new arrivals, there are the newly returned: Toni, who has the unfortunate luck of being hit by a car near the dam, Victor's mom, another student from the bus accident, Audrey, and those are just the ones we saw. And the return of our beloved cast, consisting of the previously returned and the most certainly undead. (Somehow it all sounds more complicated than it is!) Madame Costa, Victor, Camille, Simon and Lucy who appear to be living across the dam – only accessible by raft or if you're cool with swimming it. Chloé, Adèle's daughter, Lèna, her boyfriend, Alcide, her father, Jérôme, Julie and Claire are all back continuing to live another day through their unlikely circumstances, real and imagined. Finally, there are little pieces of dread and intrigue: no one could explain how the flood happened so fast, the agenda of Berg, newcomer to the scene and all of the victims' bodies have not been recovered. 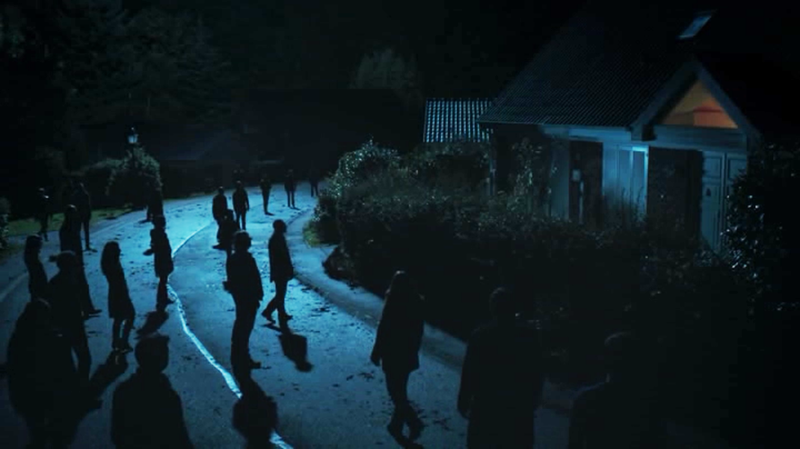 And big ones: the roads, Adéle's baby, the horde of the returned outside of Claire and Camille's house. Per the design of the show, even at the end of an episode leading up to the birth of the baby, there's no dash to get there. It seems that with season two of this story, we've gotten used to a certain road that's no longer going to take us where we need to go. The American Diner. I have no words. Love, love, love how Oui = Way on this show. File this under the language of towns and cities: the idea that a town underwater that was draining would reveal its source of light and hope/faith first (in the streetlamp and church steeple), the highest man-made points of its design. 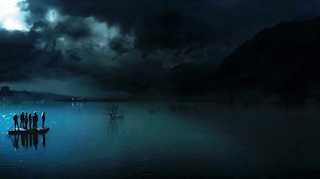 That image (also present in season one) is just unruly amounts of haunting – it's an indelible one for me. Lt. Janvier: "You'll see the people who have stayed are a bit – strange." Lt. Janvier: "You like out-of-the-way places?" Berg: "I'm from around here." Victor: "But will you always be with me?" Léna: "I can't stand being alone anymore." Adèle: "I don't want to have the baby. I don't want it to come out." Chloé: "But will he be like us or like them?" Everyone looks older. Has it been two years? Victor in particular doesn't look tiny any more. Not a surprise, I guess. Lovely review, Heather. Thank you so much for covering this fascinating show for us. I've been humming the creepy theme song for a couple of weeks now. Just a little note: "Way" ("ouais") is very commonly used in French. "Oui" and "ouais" are basically the equivalent of "yes" and "yeah", with the second being more informal. "I don't speak French, but consistently the subtitles seem to match up in word count." I took three years of French, and I was just remarking to my wife that the dialogue on this show is very literal and easy for me to understand. In other words, they're actually saying simple things like "How are you?" and "Where is it?" and "Come with me" in textbook French instead of using weird cases or obtuse metaphors. By way of contrast, I can't understand most French movie dialogue at all without the subtitles. Maybe they're just being kind to their international viewers? I meant to also mention that I'm not a fan of supernatural baby plots, although I felt bad for poor Adele, and I have no idea what they're going to do with that baby. And that I absolutely love it when they do those shots of the dam with bits of the old town poking out from underneath. It always creeps me out. The Sundance ads included "The creepy French zombies are back!" Made me laugh. Thank you for the French details, Raya and ShadowKnows. (And Billie!) Though I am in love with dialogue, generally, I wanted to soldier on with this show despite my limitations, hoping that some would chime in! I love this show. I haven't a clue what's going on (not a language issue - I speak French and, as everyone has noted, the dialogue is simple enough that I can follow it without subtitles if necessary - it's just that none of it really makes any sense!). But I love it anyway for the atmosphere and the acting. Mo Ryan described the show in her recent podcast similarly. She added that she adored how a beat on this show typically includes someone smoking and looking out the window longingly. YES!